More friends and a blog: Some Good Finds. Here are some of the goodies that I found on the most recent thrifting expedition. I love finding bags full of goodies for 25 cents Especially old goodies. 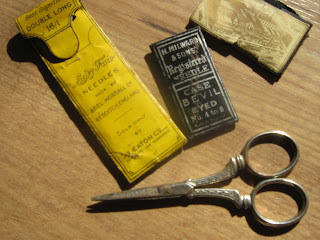 I love these scissors, the detailing on them is lovely. 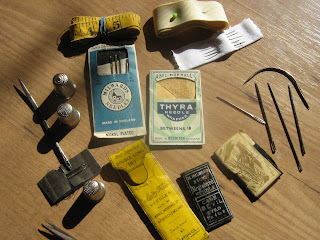 And I quite like the clever packages for the old needles, all paper, very simple. I also got this yarn from the thrift store. 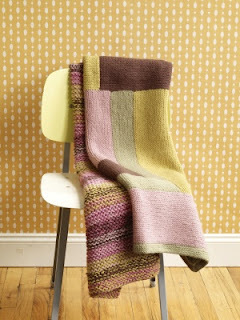 It is actually about four different thin yarns that they have wound together to make one gorgeous multi colored yarn. 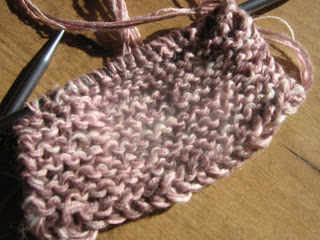 and have already knitted up a little sample in garter stitch to see how it looks. (well actually just to admire it as they already had a swatch knitted up in the thrift store so I do know how it looks). Good thing I don't have a yarn winder thingie otherwise I would have made my way home with several of those huge cones of thin yarns to mix myself. Now I just have to find a soft green at the thrift store and I will be set. 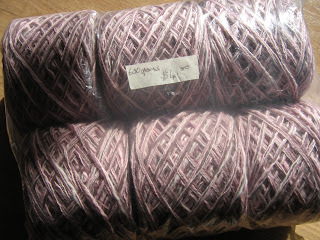 I already found a chocolate wool/silk thrifted yarn in my stash that I think will work nicely. 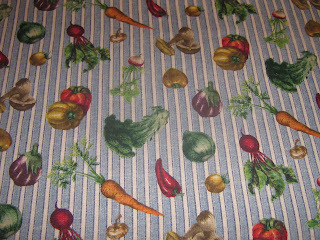 I also got this vegetable table cloth which is on my kitchen table right now but may end up being cut into tea towels. We aren't really a tablecloth kind of family, if you know what I mean. 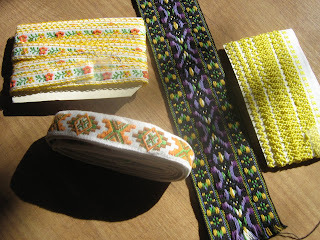 LOVE the chartreuse-y yellow trim. Neat stuff! You have a thrift shop that winds yarn??? That must be great... I counted myself lucky to once find 2 skeins of Lion Brand yarn at the ones around here! I keep looking though. I love thrift stores although called charity shops over here in England. You are so fortunate to get those lovely old sewing finds and that 1950/60s vegetable material, over here the dealers sort through goods around the back and end up taking all the good stuff, it doesn't make it into the shop for us paying public to find. I hope you find more great items of thrift! 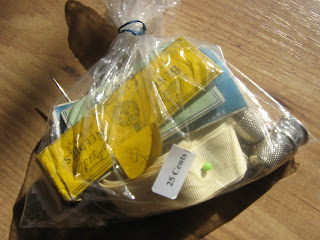 I of course really love the vintage sewing items. Great score! wow! you got some fab goodies!